A picture is certainly worth a thousand words. What better way to celebrate Black History Month than by taking a moment to acknowledge the snapshots of time that represent the struggle and triumph of African-Americans through the years? As part of our Black History Month coverage, we will be featuring one photo a day that honors years of groundbreaking achievements within the black community. These photos bring tears to our eyes, instill pride in our hearts and motivate us to carry on the legacy of strength and perseverance. Today's photo was taken on October 16, 1995 at the Million Man March in Washington, D.C. 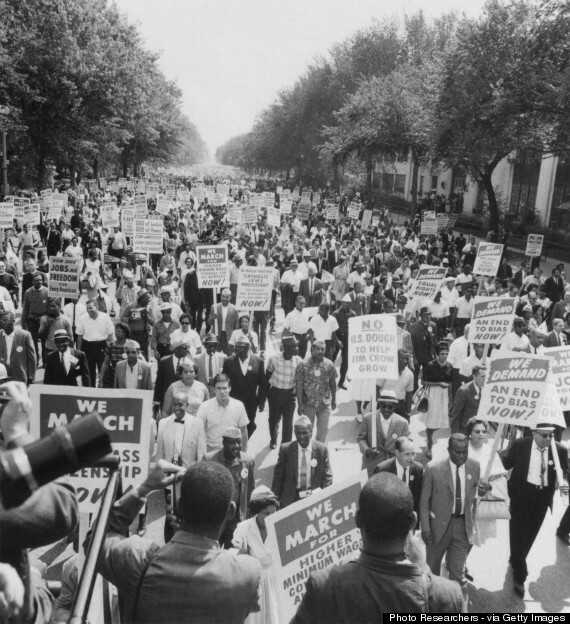 The march, which was organized as a political demonstration bringing together African American men from around the country to the nation's capital, included nearly 1.1 million participants, ranking it among the largest gathering of its kind in American history. The event was conceptualized by Nation of Islam leader Louis Farrakhan and former NAACP executive director Benjamin F. Chavis Jr., and aimed to encourage "unity, atonement and brotherhood." While addressing the crowd, Kurt Schmoke, the former mayor of Baltimore, echoed those themes in his speech. “Let our choices be for life, for protecting our women, our children, keeping our brothers free of drugs, free of crime,” he said. The Million Man March is hailed as one of modern events in the Civil Rights Movement. Take a look at the photo and share your thoughts in the comments section below.